One of the most interesting — and important — new watch releases I saw while in Geneva recently wasn’t shown at SIHH at all. Rather, it was presented by TAG Heuer. 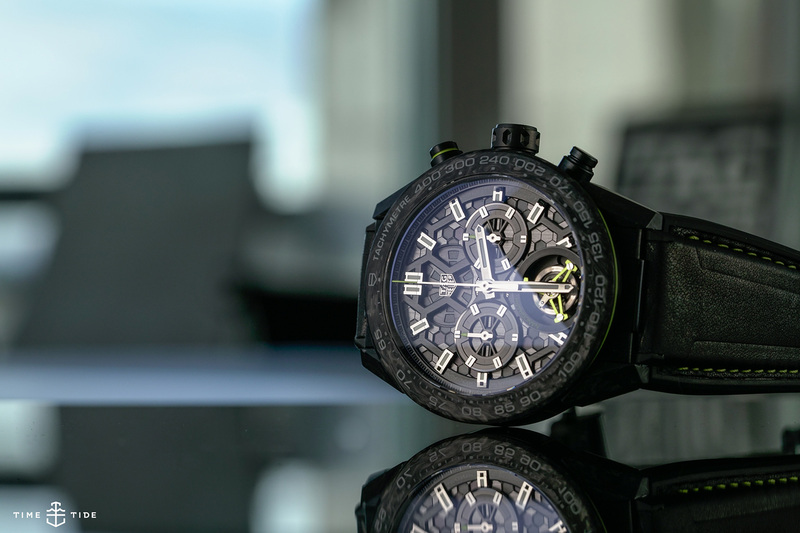 On the surface the watch is typically TAG Heuer, in look and indeed nomenclature — it’s called the Carrera Calibre Heuer 02T Tourbillon Nanograph, and has that large, modular case construction that we’re so familiar with by now, along with carbon lugs and bezels that are straight-up cribbed from their recent Carbon capsule collection. The dial texture is a little different, with a hexagonal structure that looks cool and serves as some neat foreshadowing for the Nano part of the equation. There’s also a popping fluoro highlight that looks cool, and is particularly prominent on the tourbillon cage, which is really what this watch is all about. So, a quick bit of watch-engineering 101 — the balance spring, the beating heart of the regulating organ, sets the pace and is fundamental to effective timekeeping. It’s also delicate, sensitive to the effects of pesky outside influences like gravity, magnetism, temperature and the like. Over the centuries, numerous improvements to the spring have been conceived — including the tourbillon itself (which works to counteract gravity) and, more recently, the advent of silicon technology. 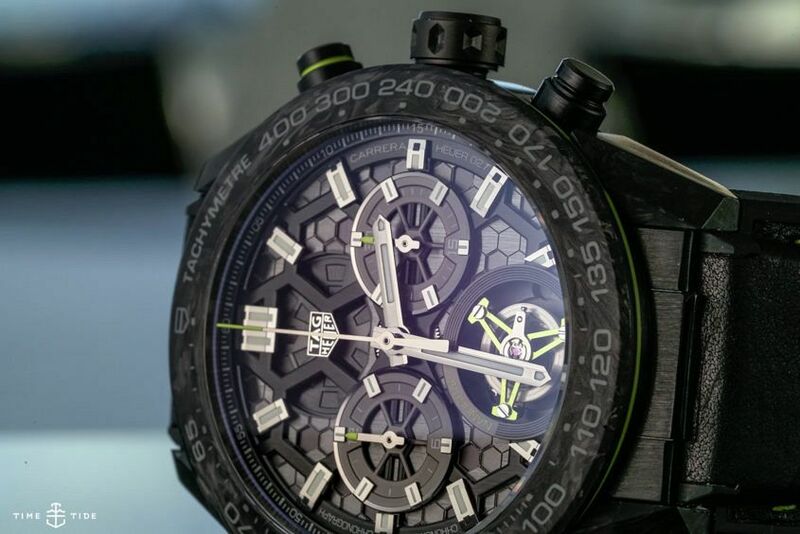 Well, TAG Heuer has taken the next step in the journey with their carbon balance spring. But if you’re thinking a scaled-down version of the carbon composite bezel, you’d be wrong. TAG Heuer has used a vapour deposition method for constructing their springs, where the pure carbon graphene molecules are arranged in a hexagonal lattice (hence the dial design). This technique has advantages over silicon balance springs in that it allows for greater consistency across production, and can be produced to allow for concentric expansion and contraction. 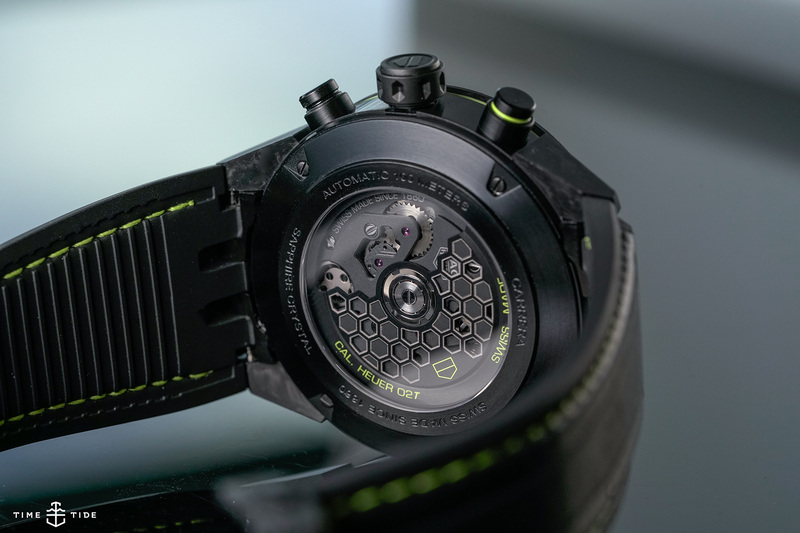 It offers a modern alternative to silicon, and TAG Heuer were fairly declarative about rolling this technology out across their watches (and presumably LVMH group brands over time). 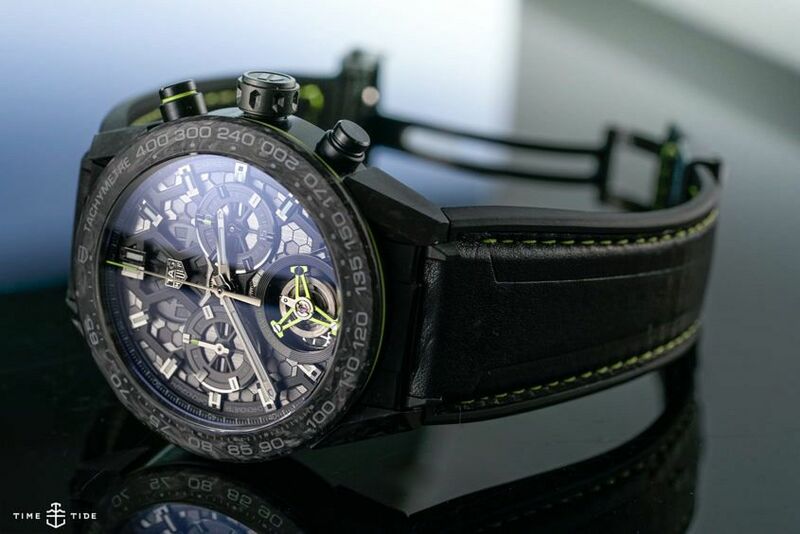 Aside from the technical coup, it offers a viable alternative to silicon (currently controlled by a consortium of brands, including Patek Philippe, Rolex, The Swatch Group and Ulysse Nardin), and could well give TAG Heuer’s timepieces a next-gen edge. A genuinely important development.